The high standards of Vladimir Ashkenazy’s previous two solo Bach outings operate less consistently in the present release. Observing full repeats in the French Overture’s opening movement, the pianist treats the introduction’s smaller note values and rests flexibly, in contrast to Angela Hewitt’s fastidious detailing. He gives distinction to the main section’s forte and piano markings, and as well in the concluding Echo movement. Note the Courante’s characterful rhythmic spring and a forthright, singing Sarabande that couldn’t differ more from Hewitt’s hushed deliberation. The zestful first Bourrée and its da capo equivalent bookend a slower, more neutral reading of the second Bourrée, while Ashkenazy’s lilting embellishments help move the Gigue along nicely. gives way to more neutral, blander tones in No 6. 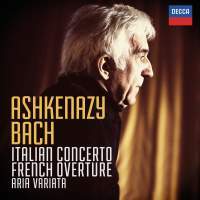 At the same time, Ashkenazy trumps his aforementioned colleagues for unabashed virtuosity in Var 2’s right-hand triplets, a brisker, harder-hitting way with Var 3 and a fuller-bodied, more vocally oriented final variation. If the Marcello Oboe Concerto transcription’s first movement is a tad square and stiff, the mesmerising note-to-note continuity of Ashkenazy’s dulcet Adagio and his subtle cross-rhythmic accents in the finale compensate. By comparison, the Italian Concerto sounds homogenised and anonymous. All the notes are solidly in place, of course, yet the textural refinement of Hewitt and Rosalyn Tureck’s carefully calibrated linear trajectory dig deeper. As deep as Ashkenazy’s Marcello Adagio.